Did you know your welcome sequence is by FAR one of the most important tools you have as a business owner to make sure your list is high-quality? Yep, you need one. Let’s break down into detail why but FIRST, what is a Welcome Sequence? A Welcome Sequence is a set of emails your audience gets right after they sign up for your list or freebie. The purpose of the Welcome Sequence is to introduce yourself to your new subscriber and help them get integrated into your community and get excited about what you offer. A Welcome Sequence can be super complicated or REALLY simple. A basic sequence has 4-5 emails and a more complicated one can have up to 20(!!!) and branch off in all sorts of crazy directions. A 5 email sequence will do the trick for most business owners out there. You don’t need more than that. Who are you and why should they follow you? What can they expect by sticking around? How do you solve their biggest problem? 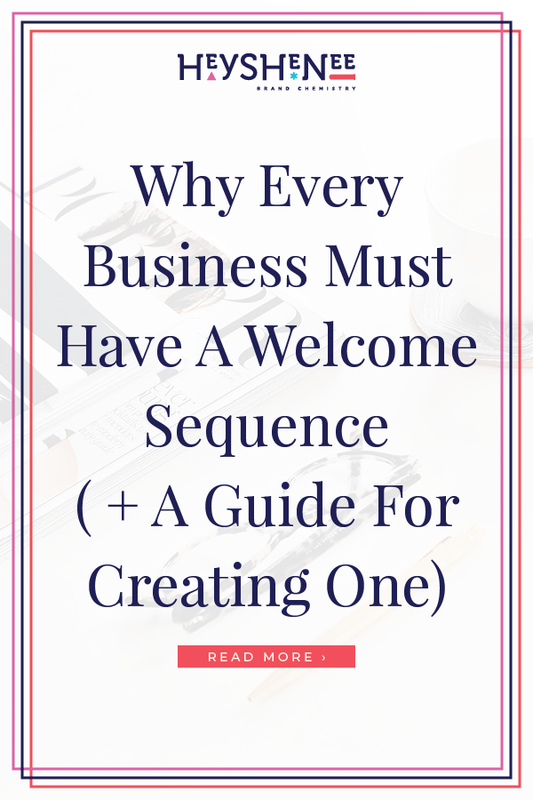 Now let’s talk about HOW your Welcome Sequence can be a total life-changer for your business and keep reading to the end, to find out the sequence I use with my clients. Okay, let’s start at the beginning. People join your list because you’ve bribed them with a freebie or an experience. Most people want that thing. They don’t want you or your content, they want the thing that you are selling. The Welcome Sequence EDUCATES them about you and what you offer so that they actually understand WHY they should stay on your list. If someone goes through your welcome sequence and decides they don’t want what you are offering or they are not interested, they can unsubscribe. If they stick around for all the emails (especially if the subscriber opens them) that means they are interested or at the very least, not annoyed. This is a great way to keep your list clean and free of people who just want your freebie and don’t want your content. Because you are sending daily emails for a week, you are REALLY going to be up in their face and that’s a GOOD THING. If they can’t take 5 emails, they won’t stick with you through a campaign and they for sure won’t let you launch. Get the wrong people out of there from the jump. When someone shows up on your digital doorstep for the first time, they have no clue WHO you are and they don’t know WHY they should follow you. Your Welcome Sequence is a great way to tell them exactly what they can expect as a new member of your community. Ben Settle, a copywriter I follow tells his audience that he WILL email every single day and most of the time he’ll be selling and so if they don’t like it, they can leave. That’s in the very first Welcome email. That might turn you off but that approach is insanely effective. Why? Because anyone left is there because they are a good fit for who he is and the style he uses with his offers. Are you super minimalist with your writing? Your Welcome Sequence is the one chance you have to put it all out there so they know and don’t complain when you send a GIF of a dancing fish a few weeks later. The best time to make an offer is within the first week of a new person joining your list. WHY? Because this is when they are the MOST excited about you. I call this the business honeymoon stage. Your new subscriber will want to consume ALL your content and get super excited about you. If you build your sequence right, it should be a story that arches out from beginning to end. Think of it as an epic adventure and your offer is their happy ending. This is also a great time to set the expectation that you aren’t a freebie farm, you are a business and as someone who is on your list, they can expect to hear about your offers pretty consistently. This is a huge problem most business owners make. Most business owners spend a huge amount of time and effort to acquire the lead but then they don’t do anything to make sure that lead is an actual good fit. You have to make it clear: you run a business and all your content won’t be free. Email 3: Teach Them Something They Didn’t Know: What is a preconcieved notion they have about the problem you are trying to solve for them? Blow their mind with your unique solution. Those are all the reasons why you MUST have a Welcome Sequence implemented in your business right now. If you feel totally clueless about how to actually WRITE one, I got your back. When you sign up for Money Words Monthly, you’ll get a guide for creating your Welcome Sequence from scratch. For only $27. You’ll also get access to Money Words Monthly which is a monthly marketing plan for people who can’t BOTHER with marketing. You don’t want to fuss with marketing. I don't want you to worry about it either. That’s why you’ll get access to my series of shortcuts that will help you easily create income-generating copy in your business without the stress and overwhelm. All for $27, which is basically just a chipolte order for two!